SUMMARY: If you didn’t make last month's live conference call on email marketing benchmark data for 2008, just click below to get your presentation and find out what 1,210 marketers revealed about the latest in email marketing. Stefan Tornquist: Hi, everyone, and welcome to our Sixth Annual Email Marketing Teleseminar. We'll be looking at highlights from the research that went into the Email Marketing Benchmark Guide which has just hit the streets. Today's session should last about a half an hour, and we're going to be answering some of your questions at the end. 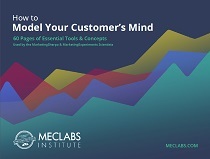 Now, if you didn't receive a copy of the PDF, shoot a quick email over to service@marketingsherpa.com and they'll get a copy to you right away. This is Stefan Tornquist in New York. I'm the research director at MarketingSherpa and I'm joined today by Senior Analyst, Tim McAtee, who was the lead author on the project. Tim, how are you? Stefan Tornquist: Now, you're joining us from Vermont. You're taking time away from a ski vacation to join us. So, thanks a lot. Stefan Tornquist: OK. So, let's jump into our first slide. This takes a look at where the data is coming from. As always, one of our principle sources in our industry-largest survey of email marketers and agency pros. This time, we had a sample of over 1,200 people and we complemented that with a number of partnered pieces of research and surveys of consumers, business executives and, of course, as we do every year, we'll be taking a look at one of the lab tests that we conducted in the Eye Tracking Lab. In addition to that, we used the background information of Sherpa's 800-plus Case Studies and 'best of' data from over 500 research organizations. We incorporate that, we talk to it and it really fills in the gaps. Now, Tim, I had a question which is, this sample set of over 1,200 is a bit smaller than we've seen in previous years. Why is that? Tim McAtee: Well, we were a bit more stringent this year with who we sort of let through the survey. One of the things that we've been trying to do, I think, organization-wide, is really making sure that we do screen and make sure that who we're talking to are the people out there doing these things and not just sort of bystanders. So, we are truly talking to the people who are making it happen. Stefan Tornquist: Right. One of our benchmarks is, do they know their own benchmarks? There are a lot of email marketers who aren't necessarily familiar with the metrics of their email marketing. So, we try to screen those folks out as much as possible. All right. Let's jump into our first content slide, slide #3. This is the changing impact of email. Now, anyone who attended last year, or read last year's guide, may remember this question because it's the same one that we've asked for several years and it's a general question that takes the temperature of the industry. What was really interesting to me this year is you see a shift away from those folks who say that the impact of email is increasing a lot and it shifts into those who say it's not changing noticeably. Now, you could still look at this, overall, in a very positive light. The number of folks who say that the impact is decreasing is still very small and a very small increase from previous years. But, we do see this shift towards the middle. So, the positive reviews are really much more guarded than they've been in the past. So, why is that? I think to best address that, let's move on to our next slide and look at some of the challenges that are facing email marketers. So, Tim, tell us what question were people answering here? Tim McAtee: Well, we asked people to rate what their top challenge was out of all these challenges, to them personally. What we saw was just, sort of across the board, an aggregate; recipient mailboxes just being swamped, just kind of bloated inboxes and just too much email in general really came in at the top. But, one thing we also found was that, as you sort of slice and dice the data, you're seeing that ESPs and people who deal more with the tactical end, they tended to rate deliverability, which is way down there at the bottom. They were a lot more likely to rate that as the top challenge, and then they also rated spam as a bigger challenge, whereas, marketers and in-house people that are more tasked with the strategic end of things oftentimes were more likely to rate swamped email inboxes as their chief concern. Stefan Tornquist: Interesting. When I talk to consumer marketers about email, there's a concern that it's falling out of favor with younger users. It's giving way to text messaging, communication within social networks. Is that pattern a reality or a perception? You've had a lot of experience in consumer marketing for large organizations. Tim McAtee: I would say that it's a two-sided issue where there is some cannibalization of the email inbox occurring, where a lot of marketing messages, and messages in general, are going towards SMS and social network inboxes. But, they're all inboxes and, overall, younger demographics are absolutely more likely to use these things, increasingly likely to use them, and I think as you see sort of the youngest demographics entering the workforce, you're seeing an aging of their immediate consumption patterns, as well. While a college student may heavily rely on SMS, once they come into the workforce and are more chained to their desktop – for better or worse – you are going to see kind of a shift in media usage patterns towards email and away from some of those other functions. Stefan Tornquist: Exactly. All right. Before we move on, I think people probably are wondering why deliverability is rated so low here. Remember, the question we were asking was 'What's your top challenge?' And so, to me, it's very encouraging that deliverability doesn't show up in this ranking very strongly because, yes, email deliverability is an issue for everyone. It's an issue they're aware of and they're aware of some of the tactics to confront it. So, what this says is that the primary concerns are around how to make email compelling, how to make email relevant and that is where the chief challenge lies, and where the time and effort should be spent. Now, we'll be talking more about deliverability. It's not going away as an issue and, of course, the solutions are very important. Let's move on and take a look at this next slide – very interesting stuff. It answers the question, 'Where does email live?' As we look through it, we'll find that email is often homeless. Tim, do you want to talk us through this chart? Tim McAtee: Sure, Stefan. This is from our internal research that we did where we asked 1,200 marketers – where the money was coming from when they were budgeting for email. What we found is that a really large chunk of them had no separate line item for email, which is a little discouraging, a little scary. And while there is, as we're looking at this data, small in-house marketers are slightly more likely to say that there is no specific line item, you still have 33 percent of large in-house marketers saying that there is no specific budget. Among those who do budget for it, you're seeing kind of an interesting thing here, where the largest chunk of them are tying their email budgets to overall on-line budgets. This is good in the sense that, as overall on-line budgets are increasing across the board, just as more and more analog media has switched to digital and usage across the board changes. So, just everything attached to on-line is being buoyed up by that. However, you're seeing a lot of people here who are tying things to specific strategic initiatives, such as lead generation, branding or CRM. The upside to that really is by tying to email to strategic initiatives, it sort of forces marketers to really put their money where their mouth is and really work to earn the budget. The massive upside to that is that email really is a very effective tool. So, if they do it correctly, they can very easily increase budgets and buy the sorts of technology with those increased budgets that would really increase results and, in turn, make everybody happier. Stefan Tornquist: It's fascinating to me that here's a tactic that has routinely scored as having the top ROI, no matter which slice we look at. We did a survey of over 3,000 search marketers earlier this year and asked them to rank the ROI, the number of different on and off-line tactics and, even they, these people who are obsessed with search marketing – house email still scores at the top for them. So, it is truly remarkable that such an important tactic would be left out in the budgetary cold. Now, quick question. When we're saying small versus large in-house marketers, what was the line in the sand there? Tim McAtee: I believe the line in the sand was 500 people in an organization. Stefan Tornquist: OK. Thanks a lot. All right. Let's take a look at our next slide and we're continuing along with our email spending theme. How do you view these numbers? It looks like most people are in that sort of holding pattern. Well, I don't know if that's entirely true. A major chunk are in a holding pattern, but I guess about a quarter are looking at fairly substantial increases. Tim McAtee: Yeah. You're seeing 27 percent who are 1 1/2 times or more greater than last year. So, I think, again, that speaks a lot toward just digital media as a whole kind of coming into adulthood here. And, I think everything is coming up with it, but I do still feel that email marketing can cite for a greater share of budget. Stefan Tornquist: Well, absolutely, and simply having a budget makes a big difference. In these numbers, we sort of see a chicken and egg scenario. There are those who are increasing their email budgets aggressively. They're more likely to say that the impact of email is increasing substantially. So, we don't know. Are they raising budgets in responses to access or achieving better results thanks to investment? I don't think it really matters. The concept of email as this cheap mass communication device, that's a direct cause of the inbox overload that marketers are afraid of. And, to get noticed, to get valued – more importantly, to be trusted and valued by recipients - there's no magic formula, but some of these things do require investment. It requires testing. It requires a real commitment to content, delivering to various segments and their appropriate times, and so on. So, yeah. It's cheap to send an email, but it's not necessarily free because you really need to do this work around it. You need to have the people and the technology in place to do it right, or you're really throwing money down the well. Stefan Tornquist: All right. We're now on slide #7, and here we're looking at a very interesting study. What we did here – and this was with Pivotal Veracity – we redid a piece of research, essentially. We did it a little bit differently, but, by and large, we were looking at how companies, major emailers, are affected by false positives at the top ISPs. So, we looked at accounts from Hotmail, Windows Live Mail, Yahoo! and AOL. Pivotal Veracity also set up a seed account, an internal account to look at things like authentication systems used, and so forth. So, in the two years since the original study was performed, we don't see much change at all. Things have not gotten better. One of our suppositions was that with the increase in the importance of email reputation, that we would see a decrease in the percentage of companies affected by false positives. We don't really see that. We see, pretty much, the static number from two years ago. Just under half of the companies were affected by false positives. Even that number is lower than reality, probably, because the way we chose to do this was to be as conservative as possible. So, any company that didn't send any email – or more accurately, from which we didn't receive any email – was eliminated from the list and replaced by another one. Now, some of those companies were probably filtered, but our simple assumption was: since we didn't get any email, we're going to assume that they didn't send any. Undoubtedly, many of them did. Undoubtedly, many of them were filtered. So, that 49 percent, that's the best case scenario. So, one of the most interesting data points that came out of this was that only 8 percent of the companies were affected by false positives at all three ISPs. So, what that tells you it that the measures for deliverability that they're using are still very different. So, one reputation score – a reputation score that gets you through on one isn't necessarily going to get you through on another because they're using different criteria. AOL, for instance, is almost exclusively using the complaints of email recipients to determine reputation. You get a few spam clicks and your reputation and delivery is seriously impacted. The other interesting thing was that in no case was a company's email filtered into the junk or bulk box all the time. So, what that tells you is that reputation is probably not the only measure that is contributing to deliverability. One would assume that if a company's email reputation was either good or bad, either all of their emails or none of their emails would be affected and sent to the junk box. In fact, what we're seeing is that deliverability is variable, which suggests, anyway, that content is still playing an important part. I don't think that's a bad lesson for marketers to get because it's probably good that we can't just sit back and rest on our reputations and not worry at all about what the content of those emails is. So, again, false positives, still very much an issue and nothing replaces simple monitoring of deliverability. The reputation scores that are available for free, they're a great place to start, but none of them can quite tell you the whole story. Let's move on. Now, Tim, this was a very interesting survey that we conducted with Q Interactive and it included thousands of consumers. How big was this sample size? Tim McAtee: It was 200 – I'm sorry – 2,937 consumers across a huge swath of ages and ISPs. It's got every reason to be representative of the online universe. Stefan Tornquist: Right, and also interesting was that they had two groups in there, didn't they? They had one group who had recently hit the spam button, the complainers – we called this The Complainers Survey. So, they had one group that had recently hit the spam or bulk button, depending on which ISP they used, and then they had another group that was simply a control, right? Stefan Tornquist: So, in the book, we see a number of responses and differences in how these two groups behave. But, here we're looking at how people are defining spam. Do you want to talk us through this? Tim McAtee: Sure. And just to sort of back track a little bit. Just one thing that I noticed looking at the control versus the complainers in this survey was that there wasn't a ton of difference in the attitudes. The difference was mainly in sort of the savviness of the users; that people with more tenure, more experience on-line, were more likely to take advantage of things like the report spam button, rather than just simply ignore or not really be sure what to do with these things. So, this chart, in particular, we're looking at – I believe these were all complainers. The way this is broken out is, from top to bottom, we're looking at what people consider to be spam and this very nuanced view of how do they interpret these things from a sender they know versus a sender that they don't know. What you're seeing is, at the top, you've got a bit of a gap between sort of how people feel about spam from known versus unknown, about emails that arrive too frequently. Now, what you're seeing is that emails that are arriving too frequently from unknown senders, 69 percent of people consider that spam. But, even from known senders, 50 percent consider emails that are coming too frequently to be spam. Toward the bottom, you have more universal definitions where there's very little nuance; things like, 'all email messages I did not sign up to receive'. Any sort of permission-based marketing that doesn't follow good permission rules, people are just considering it spam. They're just hitting the spam button and it really says a lot about how marketers need to be careful about whether or not they're accidentally spamming their best customers by sending things too frequently, by using lists that are unproven, or by not following adequate permission practices. Stefan Tornquist: Well, and in particular, I think it's consumer marketers who need to be especially aware of this. Not that these issues don't come up in B-to-B, but it's certainly less common. When you think about consumer mailers and the ISPs, the email services that their recipients are using, those are the same ones we were just talking about in the false/positive study. For all of those people, they've got a 'this is spam' button, 'this is junk' button sitting right in front of them. They don't typically unsubscribe. That's the tact they're going to take, is hitting that button. They don't know that it affects your email reputation. They don't care. If they're getting too many emails, even if they know and love your company, they don't necessarily love your emails if they're coming too frequently and they're going to hit that spam button. Take the example of AOL. You're going to start finding your entire campaign blocked, or major sections of it, and then it gets extremely expensive and difficult to reengage these folks. So, certainly for consumer marketers, our first data point here should really be taken to heart. Let's move on to slide #9, opt-in sources and volume versus quality. As you can see from the chart, as you move from left to right, that shows us the increasing quality of an opt-in. As you move from bottom to top, there's an increased volume of opt-ins, and then the size of the circle shows you how common a tactic it is within email marketing. So, newsletter offers, for example, the most common tactic – also still scoring very well, by the way – and you can compare that with something like co-registration, used by a much smaller percentage. In the book, there are the numbers, as well, but we very much like this visual presentation. So, Tim, what struck you about some of these different sources of opt-in names? Tim McAtee: I think the thing that struck me the most was that, as we sliced the data for B-to-B versus B-to-C, you really did find a difference in what was working and the other really interesting thing was just, as you quantify these things on three axes, you really see then spread out. You get a really interesting view of how these things are actually working and I think, for a lot of us, it just validates some gut instincts that we kind of know that, with something like a sweepstakes, you are going to get a lot of volume, but you may not get the best quality. Whereas, with something like – what's a good example here – customer service call-ins, you get great quality, but not a ton of volume. So, it really sort of speaks to using the right tactic to match your strategy and kind of what's out there and what works. Stefan Tornquist: Exactly, and even something – take co-registration, which doesn't score very high on either axis. Even so, there are plenty of marketers who find it to be quite effective. It's really about how well you do it. In the case of co-registration, best practices around that, like not getting batch names, getting names immediately once they register with a co-reg partner, rather than waiting a long period before responding to them, that's a best practice. It has a huge impact of their likelihood of becoming a quality member of the list. Whether or not you require to people to subscribe specifically to your publication, even after they've taken part in a co-reg form, these are the things that take a mass of low quality names, and turn it into perhaps a smaller number, but much higher quality names and people who will be valuable members of your list. So, just because some of these don't rank very high, it doesn't mean they should be off the table, but the further they are from that top right corner, the more difficult it is to really get the maximum value and the more carefully the strategy should be sought out. Let's take a look at the next slide. We're now on slide #10 and this looks at the impact of segmentation. So, what we're looking at here are open rates and they're open rates for two different kinds of campaign; one, high segmentation, where a lower number of emails and a higher number of campaigns were sent versus the reverse. This was conducted in partnership with Email Labs. They gave us spreadsheets of data concerning thousands of campaigns, and the reason I included this slide is not because it's surprising, but because it quantifies and puts in – not quite black and white; more green and tan – the stark difference between sending highly segmented, thought-out campaigns versus undifferentiated ones. It makes a tremendous difference, and as we see in the case of the people who have been list members for 0 to 30 days – and those are probably the most important people on your list – well, second to your buyers – but very important in that they're in that early stage. This is when they either get engaged or not with your brand and with your communications. The difference here in that first stage is just about 100 percent. We see almost a 21 percent open rate for the 0 to 30s in the low segmentation group and almost 40 percent for those who are highly segmented. That tails off a little bit as time goes on, but it never fails to be much more effective to use a high degree of segmentation. Let's take a look at our next slide, and this is slide #11. Here, we're looking at three email newsletters through the heat maps of Eye Tools and our Eye Tracking Lab. A very interesting study, at least to me, in part because we were slicing and dicing our own email newsletters, looking for ways in which to both set a benchmark for how often ads are viewed and also to look for how quickly attention trails off and what you can do to combat that. What we're looking at here are the first, second and third viewing of these newsletters by the same population. What you can see, if you look in the left hand column where the ad sits – it's a little tough in the PDF, but – roughly 60 to 70 percent of the test group looked at the ad the first time they saw the newsletter. That dropped by about 20 points to the 40 to 50 range in the second one, and dropped much more in the third. So, what we're seeing is banner blindness in action, and I think this would probably apply on a web page, just as it does in this email. So, what do you do about it? There are a couple of things. In the study, we looked at how position on the page affects things, because to the extent to which you can change up the positioning of ads, of course, that's going to make a difference. People become very used to their mental map of a page, and so changing that map, that can be very effective. We also looked at ad rotation. Even if the ad is on the same topic, making it look different – not necessarily just one graphic to another, but even moving from, say, an entirely graphical ad to a test list, for example, that can make a difference. Finally, we also looked at changing up the different elements within the ads themselves. That can have an effect, but really, it's those first two that, when it comes to overall attention, they make the biggest difference. Some very interesting findings there. All right. So, rich media email. This was something that was alive in the late '90s, sort of dead for the last few years. Has it come back to life? Tim McAtee: Sort of. I think the thing that we're seeing, in general, on-line is that with increasing broadband, with more people having better computers, just sort of more content out there. People's usage patterns are changing and I think, frankly, back in the '90s, a lot of people jumped the gun on rich media. Just because you could create something that worked beautifully on your desktop didn't mean that you could stream that same experience on-line. In this case, yes, you could sort of send something into someone's inbox that works beautifully in their inbox, but the chances of it actually making it into their inbox are pretty slim. What's happened is sort of this hybrid approach that I would say is a best practice, where people are sending, basically, images that tell a consumer that, 'if you click here a video will occur', 'if you click here music will occur', if you click here, something will happen, basically, but that something that happens is often on-line and a click away, as opposed to in the actual email. The email, itself, is usually just text and graphics, and by doing it that way and by sort of keeping the meat elsewhere on a website, instead of in the email, it really does help with deliverability. I think, from the consumer standpoint, as long as it's predictable, as long as the button says, "Hey, if you click here, you're going to get a video", and then the video actually happens, I don't think consumers really care how it happens. They just want it to be an interesting and seamless experience. Stefan Tornquist: I think you're absolutely right and I think the way this is treated in this email really is the best practice. It looks like something might happen if you click on it or something will happen when you click on it. You don't necessarily know that it's going to happen in the email, but the design fits and is reminiscent of video ads on website pages and is quite compelling. Tim McAtee: Yeah. In a B-to-B setting, I would just say – or really, in a newsletter setting, as well, I would just recommend instead of doing an entire image like this email, maybe mix in some text with some images so that just in case the images are blocked, you've still got text saying, "Hey, there's the video if you click here". Stefan Tornquist: Yeah. That's a good suggestion. That ends our first set of content slides. We will be addressing a couple of your questions in just a minute. Before that, let me just quickly tell you a little bit about this benchmark guide. Although we've talked about some of the special reports, inevitably, you will find those essential benchmarks in this book; open rates, click rates, etc., split B-to-B and B-to-C. That is the core of these books. This one comes in at 328 pages, so I trust you'll find something useful. Also, if you turn to our last slide, we would love to invite you to join us and 800 email marketers in late February, in Miami, Florida, for our Third Annual Email Summit. It's our second in Miami. There's the link there on the page and you can see some testimonials and look at the schedule. This year, in addition to some general sessions, we're going to be splitting out B-to-B and B-to-C. So, with the marketing pitch dispensed, let's answer a couple of questions. Tim, here's one for you – and I know that you did quite a bit of research around the satisfaction level that email marketers have with their different solutions; whether that's in-house versus vendors, and that's exactly what the question is here. Tell us something about the experience and satisfaction, third-party vendors versus utilizing internal systems. Tim McAtee: In our survey, we asked a lot about what technology people are using for their email marketing, and then, of the people who were using it, how satisfied were they with it in terms of cost for the money, just all sorts of technical things, as well, and I think one of the things that we've found is that really all the technology is really helping; that, kind of across the board – and I don't know. Not to be too blunt with this, because I'm a researcher and I like to quantify things, but kind of the more money you spend, the more happy people are with their technology. But you are seeing that, really advanced ASP systems are really helping people out. You're seeing them pumping some cash into deliverability solutions through an ESP, even full-on outsourcing, as well as really, I think, taking advantage of the full capabilities of an in-house email system, really are helping people. I hope that as emailers get more budget, instead of spending it on just more lists and more names, that they spend it on the technology to, instead of email more, email better. I would say that all your emailing marketing peers out there would definitely agree with me that by upping the technological savvy, upping the ability to segment, upping all of the nitty-gritty, nuts and bolts stuff of getting an email in an inbox, making it look good and having strategic segmentation from A to Z, the whole way across, really helps. Long story short, go out and spend some money on software. Stefan Tornquist: All right. Well, I think we've got time for one more question and this is one that we get annually. Have there been any changes to the optimum times and days to send? In this case, this person is asking about an IT audience specifically, but I think I can answer in general that, by and large, we don't see a major shift. Click rates, anyway, continue to be a little bit higher on Mondays than they are on the other major emailing days, but remember that the high volume days are Tuesday, Wednesday and Thursday, so Monday perhaps benefits a little bit from that slightly lower volume. But, the consideration there is that click rates are an intermediate metric. Right? They don't tell you the ultimate dollar value of the click. All you know is, well, I got some more clicks, but you don't know were clicks on Monday, for example, more likely to be very short sessions? I know that on my Mondays, I don't do a lot of shopping. I don't do a lot of extraneous things because it's the beginning of the work week. I might click on something that I'm interested in, but I don't spend the kind of time with the articles and content that I might on another day. I think that holds true for different demographics and it's really important in this, like all testing, to not stop with the click rate, but to, whenever possible, look beyond that to a real performance indicator, whether that's an action like a download, or a real paid conversion. So, does the day of the week make a difference? Yes. Does the time of day? Absolutely. Is there a golden rule that applies to all emailers? Absolutely not. And, is it something that's worth testing? Definitely. Just try, if you can, to go beyond open, beyond click and to a metric that really matters. So, with that, thank you all very much for attending today. Again, if you have any need for the PDF, if you've just been listening on the phone, just email service(at)marketingsherpa(dot)com and they'll get you a copy. Thank you again for attending, and Tim, thank you. Tim McAtee: Thank you, Stefan. See everybody in Miami.